The electron temperature (Te) and electron density (ne) of a helium glow discharge was determined at different pressures. For Te calculation, two different techniques were used that is specific for two different plasma models: line intensity ratio for steady state corona model and Boltzmann plot diagnostic for local thermal equilibrium model. The calculated electron temperatures are then used to calculate the electron densities through the Stark broadening technique and the plasma conditions over which both models apply were verified through the limit set by each model. J. L. Sagisi, M. Celebrado, R. Emperado, and W. Garcia. 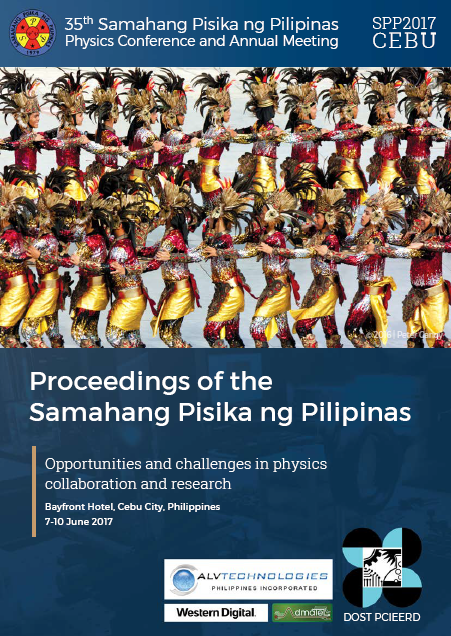 Electron temperature and density measurements on helium DC glow discharge by optical emission spectroscopy, Proceedings of the Samahang Pisika ng Pilipinas 35, SPP-2017-2D-04 (2017). URL: https://paperview.spp-online.org/proceedings/article/view/231.